Lama Zopa Rinpoche visits Wisdom Publications in Boston, USA. on July 29th 2007. Rinpoche will be giving the lung of the Golden Light Sutra at Tibet House in New York, USA at 2pm on Sunday Sept 9th. Rinpoche will then be giving teachings on the Three Principal Aspects of the Path and 21 Tara initiation at Guhyasamaja Center, USA on Oct 20 – 21. Rinpoche recently wrote to the Basic Program students at Istituto Lama Tsong Khapa in Italy who have just completed a three month lam-rim retreat. In this letter, Rinpoche gives us all encouragement to practice what we have studied, and explains how this confirms the Buddha’s teachings and is the best offering to oneself, sentient beings and world peace. something to affect their heart, and fill their hearts with great satisfaction, deep joy, and meaning, then this comes from retreat and practice. …I am extremely, extremely pleased. Even in the beginning there were some difficulties, but you all took my advice to do the retreat on lam-rim, so you experienced yourself; you got the real taste in your heart. Bringing the total number of FPMT centers and study groups worldwide to 151 in 33 countries! Sadly due to financial and organizational difficulties, Osel Study Group in Goa, India is closed. Thanks to all who helped the group during its 6 years of benefiting beings! Liberation Prison Project’s 2008 Tibetan Calendar is now available! In its tenth year, this small wall calendar features Buddhist images, inspirational sayings from great masters, and the Tibetan lunar calendar, including all the holy days, precept days, etc., for the Year of the Earth Mouse 2135. For centers who would like to purchase the calendar wholesale, please see this link for distributors in your area. The first batch of 5000 Merit Box kits is nearly gone and we are working on redesigning the box and booklet for the next set. Many dedicated translators have submitted the Merit Box practice in their language for addition to the booklet. The new version is a snapshot of our global FPMT family and will contain 11 languages! The role of women in the Tibetan Buddhist Sangha features strongly in the October-November issue of Mandala, due out around September 9. So, too, do some amazing teachings. The long anticipated statue of FPMT’s founder Lama Thubten Yeshe arrived at FPMT International Office on August 1 and was greeted with katas, incense and tea. Gold leafing and construction of a throne are in the works. We are still looking for some professional publisher assistance. Editor Nancy Patton is in Australia for the duration, Associate Editor Sara Blumenthal is on maternity leave with baby Benjamin Jack born July 25, and Subscriptions/Advertising manager Sandra Peterson is holding the fort brilliantly. What would help Mandala right now? How about each of you walking into a news agent or bookstore and asking if they stock Mandala, and if not, why not? Every positive thought, every new subscription – they all help to keep us going. New – They have arrived! The Rituals Training Manual, Tulku Talk and Intermediate Practices of Vajrayogini are all now available from the Foundation Store. The Six Session Guru Yoga glossy booklet will be arriving very soon; look for it in Practice Booklets. Coming Soon – Glossy booklets of Practices of Namgyälma, Preliminary Practice of Dorje Khadro, and Preliminary Practice of Tsa-Tsas. At the end of October Chenrezig Institute will offer the Basic Program (BP) Final Exam 2007. As one of our few residential BPs, the level of study at CIN is impressive. In fact, most students sitting the exam have attended more than one round of CIN’s demanding study program. These BP graduates will join those at Maitreya Institute and Institute Lama Tsong Khapa in receiving the first FPMT Basic Program Completion Certificates. And at Nalanda Monastery another outstanding Basic Program will start February 2008: five years full-time residential, in a monastic setting, in three languages (English, French and Spanish), complete with final exam and three month lam-rim retreat! We’re very happy to let you know that this year’s one month November Course at Kopan Monastery, Nepal, will be led by Ven Kaye Miner. 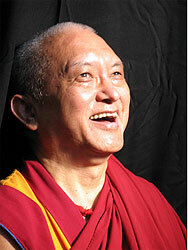 Lama Zopa Rinpoche will teach towards the end of the course. The one month course at Kopan is an essential introduction to FPMT’s unique style of practice and study of Buddhism – and highly recommended, inculding for those offering service in FPMT centers and projects. 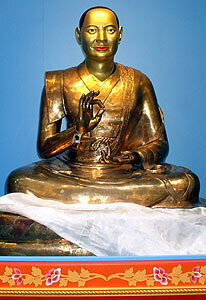 Venerable Kaye Miner was born in 1959, and raised in Australia where she first met Tibetan Buddhism. 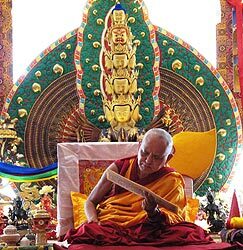 After attending the 1985 Kopan November course, she took teachings from Lama Zopa Rinpoche and worked for FPMT International Office before being ordained as a nun in 1990. She has been the spiritual program coordinator at Tara Institute in Australia and Maitreya Institute Amsterdam. Since January 1, 2003 she is also the director of Maitreya Institute Emst and is the resident teacher at Maitreya Institut, Amsterdam. Venerable Kaye teaches in easy to understand English. 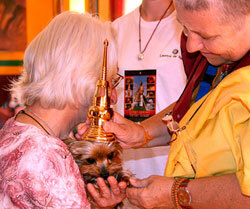 Little dog being blessed with the holy relics of Shakyamuni Buddha, in Colmar, France. For more details about the Relic Tour events around the world during 2007, please email or visit the Relic Tour Calendar. This is your chance to be part of Lama Zopa Rinpoche’s Animal Liberation Sanctuary by entering our first T-shirt design competition to create a brand embodying the message of animals as sentient beings and the character of animals to be rescued. The winning design will be used to promote FPMT’s sanctuary at Kopan monastery in Nepal and will be featured on items such as T-shirts and bags. The judges are looking for something eye-catching and simple with a design that works in two colors. The first place award is a glass ‘dzi’ bead donated by Khen Rinpoche Geshe Lama Lhundrup, abbot of Kopan Monastery, and a runner’s up gift of a limited edition print donated by internationally renowned thangka artist, Andy Weber. Please email the Sanctuary Coordinators, Tania Duratovic & Phil Hunt, for competition conditions and submission format. The Competition closes on October 1 and the winner will be announced on World Animal Day, 6 October 2007. One of the core aspects of Buddhist practice is understanding our own mind. Why do we think, feel and act the way we do? How easy is it to really fully understand the complexity of emotions and reasons that motivate our adventures through everyday life? The recent Stern Report to the UK government pointed out that the costs to the UK treasury of the disasters likely to arise from climate change were predicted to be far greater than the costs of averting the problem in the first place. The human cost is predicted to be even greater than any monetary loss. So why are we, as a species, still collectively engaged in everyday activities that are authoritatively predicted to cause enormous harm to ourselves and all other beings? It is, at best, illogical. For practising Buddhists, the question takes on larger dimensions. Are we aware of the processes in our own minds as we engage in these actions? Are we aware of acting ‘illogically’? If these actions are known to cause harm to ourselves and to others, then to engage in them is to break our commitments to practise compassion wherever possible. At the same time, we have a sense of ourselves as compassionate people who have no wish to harm others. So where is the blank spot on our mental map? The responsibility falls on us as Western practitioners to explore our own minds and culture and come up with our own solutions in the context of Buddhist compassion. 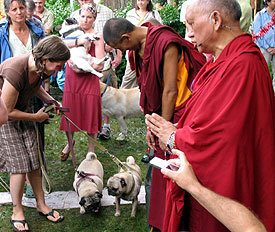 In July 2007, Rinpoche said He would like an animal blessing to happen if possible when He visits centers. Animal blessing organized during Rinpoche’s visit to Kurukulla Center, Boston, USA. July 28th. New opportunities include Spiritual Program Coordinator at Root Institute, Bodhgaya, India and Director of the Community Center run by FPMT Mongolia in Ulaanbaatar!